This section may include details on including updates, since an update is software (which is meant be to be an update to other software). The presense of software is typically noticable. However, the method of installation may be done “behind the scenes”, so an network administrator may be able to perform this without much (or, perhaps, any) interaction by the end user. This way of thinking may not work in nearly as many scenarios today. The rise of Internet usage and Internet-based malicious activity (most definitely including criminal activity) has led to an increased importance on computer security. Running the latest code, or at least the latest code that is marked as “stable”, is basically a standard expectation of decent modern computer security. During an interactive operating system installation there may be an opportunity to install software. The list of software that can be installed will be similar to what is found by installing integrated software. Package manager software is often set up to download software from trusted archvies. If some software is found to have a security vulnerability, it may be pointed out. If a software developer is refusing to fix an obvious problem, and/or for other reasons the software appears to be malicious, the people who maintain the public archives may decide to stop hosting such software. This oversight by maintainers of public archives can be a deterrant from a software developer trying to distribute software which is mostly malware by nature, or by sneaking in some additional malware. The package manager handles dependencies. This may reduce the requirement for developers to deal with such things. An old article (Dec 7, 2003 A.D.), The ideas behind Compile, basically notes that Compile is designed to simplify package creation and maintenance. The basic idea is that when different groups of operating systems all use different file formats for their individual repositories, there is a lot of effort needed to support the customized differences. This section is about the suite of software that contains pkg_add, pkg_info, pkg_delete, pkg_create. There is a man page (section 5) about the format for OpenBSD binary packages, which is a different page than the man page (section 7) about the overview of the binary package system. Other software or information that is or may be related/similar: OpenBSD man page for pkg_merge, OpenBSD man page for package (name) specifications, OpenBSD man page for bsd.port.mk, OpenBSD man page for pkg_mklocatedb, OpenBSD man page for pkg-config. For OpenBSD, using an official, paid-for CD is recommended (primarily because doing so involves Supporting OpenBSD). The assumptions of these instructions are not likely to be a problem, but are hereby documented the extremely thorough who want to be cautious. These assumptions of these instructions are that there is no ~root/bin/pkgcmd command that needs to be backed up first, and that ~root/.profile has not been previously backed up to a location under /origbak/. Additionally, PKG_CACHE should be defined, the superuser's name is root, and the shell should work like sh so “ echo $( echo ~root ) ” will return a directory such as /root or /home/users/root. If any of these assumptions do not seem accurate, then modify the example code as needed. This example code uses /origbak/etc/ver6/. cp -p $( echo ~root )/.profile /origbak/ver6/$( echo ~root )/. cp -p $( echo ~root )/bin/pkgcmd /origbak/ver6/$( echo ~root )/bin/. The following code will make the necessary directories and also creates and runs a pkgcmd command which is stored in a ~root/bin directory. sudo cp -p ~root/.profile /origbak/$( echo ~root)/. About the above commands: The backslash at the end of the “ export PKG_PATH ” line is there to signify that the following white space character (which causes the next text to appear on a new line) should be ignored. If support for that is not implemented in the shell being used, simply eliminate the backslash and put the ftp URL were the backslash was (right after a colon). One may wonder why the text file is being stored in ~root/bin (where it will presumably only be readable by root) and why the script that sets the variables is stored in ~root/.profile instead of setting the variables in /etc/.profile so that all users get that benefit. The answer is because other users will have no need for those variables. The pkg_add and similar pkg_* commands will require superuser privileges, and environmental variables will tend to be reset by sudo. (The fact that the environmental variables are reset by sudo may not be noticed a lot of times because environment variables specified on the sudo command line may be expanded by the shell before sudo runs any other code, so the modified command line has the expansion of the variables before sudo clears out much of the environment.) If the pkg_add command is run directly from sudo, that may often work well if a URL or local file is specified (because the environment variables won't be needed), but if the another user's environment variables are going to be used then “ sudo -i pkg_add ” will cause ~root/.profile to load, and that may be the best way to load up the environment with these types of variables. If the currently logged in user's directory is preferred over ~root then using the ~$USER might be preferred. (It is recommended to test any variation and its effects before blindly relying upon it. Using such an alternative may not have been well-tested.) The pkg_add command is going to require superuser access anyway, so there may not be a huge compelling reason for an end user to try to set $PKG_PATH. An authorized end user may easily run ~root/.profile before the pkg_add command by using “ sudo -i pkg_add ”. This may be documented in a location such as ftp://ftp.freebsd.org/pub/FreeBSD/releases/i386/README.TXT right next to other files: Located in that same directory ( ftp://ftp.freebsd.org/pub/FreeBSD/releases/i386/ ), there may also be some text files with names like “7.1 moved to ftp-archive”. This text file may refer to ftp://ftp.freebsd.org/pub/FreeBSD-Archive/old-releases/ which has subdirectories named after architectures. Those subdirectories named after architectures may have subdirectories named after multiple FreeBSD versions. (An example directory may be 7.1-RELEASE.) The packages may be symlinks; e.g. from ftp://ftp.freebsd.org/pub/FreeBSD-Archive/old-releases/ underneath the i386/7.1-RELEASE subdirectory, a symlink named packages may point to an appropriate location underneath the location three directories up. e.g. /pub/FreeBSD-Archive/old-releases/i386/7.1-RELEASE/packages may point to ../../../ports/i386/ which is effectively being ftp://ftp.freebsd.org/pub/FreeBSD-Archive/packages-7.1-release where the packages are actually stored. OpenBSD FAQ 15: ”The OpenBSD packages and ports system”: #PortsSearch section titled “Searching the ports tree” (FAQ section 15.3.4) has instructions. The first set of instructions involves Fetching the ports tree. Basically that involves downloading a ports.tar.gz file and extracting it. The ports.tar.gz does not contain all of the actual software code: it contains a lot of pointers to where the code may be automatically downloaded from. Therefore, the file's size (perhaps between 15MB and 20MB) is much smaller than obtaining all of the source code. The ports tree is specific to a version, but not a platform, of OpenBSD. On an official FTP site, the location of this file is one directory above the platform-specific location that contains the binary installation files. The file should have extracted contents on a ports/ subdirectory. Fetching the ports tree shows an example of extracting to /usr and that may be the usual location for extracted source code (for the ports code). Versions prior to 4.7 had a folder with a URL such as http://www.openbsd.org/4.6_packages/ which provided a list of hyperlinks representing platforms. Each such hyperlink showed some information about software for the specified architecture and version of OpenBSD. The information included hyperlinks to download the files, brief descriptions, and a hyperlink to a page about that specific software with a description which could be a bit longer (around a paragraph) and often included information about the home page for the software project. OpenPorts.se: The OpenBSD package collection has history of ports. e.g. History of the OpenBSD Qemu port. Sometimes the OpenBSD Journal mentions ports. For example, searching for New Ports on the OpenBSD Journal @ Undeadly.org shows some articles about new ports being announced. Pre-order page, main site, OpenBSD Journal. For -current, view source and/or snapshots area. Undeadly forum post mentions that there may be stable “packages” (rather than just “ports”) seen in the near future. For a specific port, see OpenPorts.se: The OpenBSD package collection has history of ports. e.g. History of the OpenBSD Qemu port. Superuser access will be needed, so make use of sudo as appropriate to run software as a superuser. It is generally nicest to have the repositories set. “ pkg_add -ivv package_name ” will be verbose and possibly interactive. The “package_name” may be a URL (e.g. ftp://ftp.openbsd.org/pub/OpenBSD/#.#/packages/plat/screen-#.#.#p#-static.tgz or ftp://ftp.usa.openbsd.org/pub/OpenBSD/#.#/packages/plat/screen-#.#.#p#-static.tgz). There are also a couple of other options which are generally more convenient in the long term, but do require that the pkgtools repository information is configured. These options are to just use the filename of the package name (such as screen-#.#.#p#-shm.tgz or screen-#.#.#p#-static.tgz or just screen-#.#.#p#.tgz), or, in many cases, just using a program name that is part of the package name (such as “screen”). As an example of what prompts may show up in interactive mode, many versions of OpenBSD have offered multiple “flavors” of the program called “screen”. If the archive/repository that is checked first has multiple versions, the installation program may ask the user which variety to install. Note that this prompting may not occur if the public archive has multiple versions but if there is only one version in another location, possibly a private archive, which is checked before the public location. This means that if one or more packages are found at a location specified earlier in the PKG_PATH, then pkg_add will act like those are the only packages available. The pkg_add program will not seek out later locations to see if there additional choices to offer, unless every prior location already checked had zero packages that match the provided name. As for the package_name, that may be a reference to a local file or a URL. The PKG_CACHE and PKG_PATH directories will be checked. Checking for a man page may be fruitful. Running “ pkg_info -L packageName ” will show the list of files included in the package. Any included documentation files should show up in that list. Of course, for third party software, the website of the third party project may also include some documentation. It is generally most convenient to install a package when environmental variables refer to repository information, because then the packages can be added by name rather than path. It is likely best, though, if those environment variables are not set for standard users. This is because standard users don't have the permissions to modify the system-wide package database, so they can't effectively use the envirionment variables anyway. The way to handle this is to use commands that set the environment variables, but to use those commands only when running a command as an aurthorized user. Such commands may be placed in the .profile file stored in the directory of the user with more permissions. In the short term, it may be best to just work around this by first running a shell as a superuser, then setting any necessary variables (specifically, setting the package repositories) in that shell, and finally adding the desired package. That workaround is basically a short, and more specific, way of describing one of the workarounds that is provided in the The section about running programs as a superuser: subsection about sudo -i showing “This account is currently not available.” describes the problem in more detail, and which also providing multiple solutions which have been found to work well with this stiuation (including one which may be a bit more complicated to set up, but then may be a more convenient solution for long-term use). That shows the software that is installed. shows the list of files that came installed with the software. unless using older versions of the software: with OpenBSD 4.6 and earlier (see OpenBSD 4.6's manual page for pkg_info), a -D parameter could be used. (The new parameter was first introduced with OpenBSD 3.7, which was the first parameter to mark the old option as being deprecated. OpenBSD 5.3 was tested with a valid customization of “ -D pkgName ” and the result just showed a list of packages, as if no parameters were provided. No explanation behind any reason for the change has yet been found, and so no explanation is being provided here. Additionally, the software suite supports a method to record the list of software, and to be able to later re-install that same software (to the same machine or to a different machine) using the list of recorded software. The rest of this section discusses this more elaborate concept. Run pkg_info -m and pipe it to a text file. http://www.openbsd.org/faq/current.html#20130813 did, during OpenBSD 5.4's development, show a way of saving and then restoring such a list. It involved first running commands that were effectively like the following. Note that the reference to tee does not have a “ -a ” parameter, so this overwrites any existing file. Then the guide had even more instructions related to upgrading the operating system. To remove a port in OpenBSD, the process will also remove a package: see OpenBSD FAQ 15: section on uninstalling a port (FAQ 15.3.7). To find out if there is an update to the software, see the section on updating software. This section is simply a quick guide on how to apply updates using this package management software. Some text files may be used. There may be some other methods to edit the repositories from within some programs. (These directions could be improved.) /etc/apt/sources.list (is non-free in a separate file?) Further details are needed here (like how to manually add non-free if that was skipped before but is desired now). Make sure that any process meant to edit a list of respositories has enough permissions to do so. If using a relatively unfamiliar method to edit text files, be sure that the file was successfully saved before relying on the changes to the file. Wikipedia's article on Aptitude software: section about Google Summer of Code mentions GSoC 2008 leading to a GTK+ GUI being put into the main codebase. (The cited web page seemed down when checked, perhaps use Wayback Machine @Archive.org's archive of cited site.) (Possibly relevant: Debian Wiki about Summer of Code 2010 project Aptitude-Qt references an aptitude-gtk and adept.) That may be of more interest to GNOME uses, while Debian Wiki about Summer of Code 2010 project Aptitude-Qt will likely be of more interest to KDE users. Debian's FAQ on package management tools: section on dselect states “currently users are encouraged to use aptitude” (rather than some of the older alternatives that had been a primary method in the past). If aptitude does not seem to have an ability that apt-get does, it still makes sense to follow the OS vendor's advice as much as possible, by using aptitude for the things it does support (like upgrading info about packages). For those who use apt-get, note apt-get may not be the best way to upgrade Debian packages between releases of the operating system. For those who use dselect instead, note the section titled aptitude recommended over dselect. unknown: something like u (upgrade), m (mark all (new/updated)), u (upgrade all), g (go to screen showing packages/summary), g (go further; start installing). Wayback Machine @ Archive.org: archive of now defunct kudos.berlios.de's web page “Software Repositories and Package Management” has some command lines. See Debian's Package Management page (section on Synaptic) which offers few, but praise-worthy words. The main web page says Synaptic “provides the same features as the apt-get command line utility”. For compiling this software, (at least version 2.4 of) Gtk+ is required. Wikipedia's article on KPackage notes that KPackage supports Debian packages and some other formats. KPackage , and will be renamed to Shaman 2 (or , according to Wikipedia's article on KPackage, Shaman2). Begin with step #3 of Kubuntu FAQ with Kynaptic guide. Ubuntu's guide for installing software packages on a machine without an Internet connection lists Keryx as one option, and also provides information about using Synaptic. APTURL is recommended by Ubuntu's documentation on installing software: section about text-based methods. See also: Kubuntu guide: How to create a local repository from discrete packages? If sudo is not installed, then installing sudo is recommended. However, until that is done, leave off the word “sudo” from the command line and run the command line from a command prompt with full superuser permissions. Wikipedia's article on Aptitude: section called “Easter egg” notes that using a parameter of “ moo” may yield some interesting results in multiple programs (mainly apt-get and aptitude), and using one or more “ -v” command line switches may result in different results (in aptitude). Being that the referenced programs may be considered the most official programs in Debian to be handling APT-style packages, it wouldn't be surprising if other packages included this 4E: extremely essential easter egg. Debian's Wiki entry on Aptitude says “It does not, however, have Super Cow Powers, meaning that it does not implement the moo operation, verbosely or otherwise.” Rubbish! Ubuntu's Package Manager Troubleshooting Procedure is some official documentation by a respected project. A guide to using dlocate shows a method of identifying which package was the origin of a file found on a hard drive, noting that is faster than “dpkg -S filename”. Used by Red Hat, SUSE, Mandriva. This software had been released for a distribution called “Yellow Dog Linux” (“YDL”), although even Yellow Dog Linux has now replaced this software (with “Yellowdog Updater, Modified” (yum)). Novell has released ZYpp code as GPLv2 avialable from Github repository for Libzypp. This standard is supported by a command line program called zypper and ZYpp is also supported by a program called YaST (“Yet another System Tool”) which uses a graphical interface. Unsurprisingly, these programs are supported by Novell's products: SUSE and the “openSUSE” free variant. (Wikipedia identifies the Libzypp portal (at opensuse.org) as being the “Zypp official website”. The zypper program is also supported by MeeGo. Note: At the time of this writing, this has not been heavily tested by the author of this text. The following command line options may be helpful. That specific feature may be newly uninstallable in Windows Server 2012, but this does suggest that PowerShell can be effectively used to interact with features. This also may be an approach that uses more generalizes software than Dism. For the time being, check out the (next) section about Dism, just because that guide is currently a bit more ready for effective utilization. Social subdomain of TechNet: forum topic on installing software: November 19, 2009 post mentions a get-windowsfeature command in PowerShell. This post seems to suggest this may use .Net (NetFx2-ServerCore), PowerShell (MicrosoftWindowsPowerShell), and PowerShell Cmdlets (ServerManager-PSH-Cmdlets) features, and that “ Import-Module ServerManager ” may need to be run first (before running get-windowsfeature). Users of Windows 7 SP1, Server 2008 R2, and newer can use this (although separate installation may be needed for some operating systems). See: TechNet Blog of Package Management in Windows 10 notes this was included in WMF 5.0 Preview -- Microsoft's download page for Windows Management Framework 5.0 notes .NET 4.5 is required. TechNet: DISM Command-Line Options mentions this as being available for Windows Vista Service Pack 1, Windows Server 2008, and Windows PE (and some newer options). This command has also been known to be part of Windows 7. If the software to be installed is an optional component of Windows, then the command line software software Dism (verified to be part of Windows 7) may be helpful. For example, older versions of Microsoft Windows came bundled with a telnet.exe file which, in Windows Vista and newer, is simply unavailable until it is “installed”. Another very noteworthy option, atlhough it doesn't impact either of the following two examples, would be “ /NoRestart”. Like using the graphical interface, such an installation is a bit slow. To uninstall the software, use “ /disable-feature ” instead of “ /enable-feature ”. Dism /online /enable-feature /featurename:"More Games"
Note: If using this method to install a role, the related service may initially be Disabled. (This was noticed when installing DHCP Server to Windows Server 2008.) See adjusting running software for details on how to handle services. It looks like the log gets created, as one or more files which are not ASCII text, and stored in the %windir%\System32\ directory. TechNet: Adding Roles and Features has example command lines. Also, a comment states that “Windows Server 2008 R2”'s “ServerManagerCmd.exe tool” states “that it is deprecated and” instead to “use PowerShell cmdlets”. Windows Server 2008 Server Core may come with a program called OCList which does NOT get installed to a Windows Server 2008 Full installation, and which is expected to be removed (Retiring OCList). A list of available roles can be seen by a screenshot of OCSetup's output from WindowsNetworking.com guide to OCList and OCSetup command line tools, or TechNet: Installing and Uninstalling Roles and Features Using Ocsetup. Note: Perhaps this doesn't necessarily mean that all roles can be implemented in Server Core. 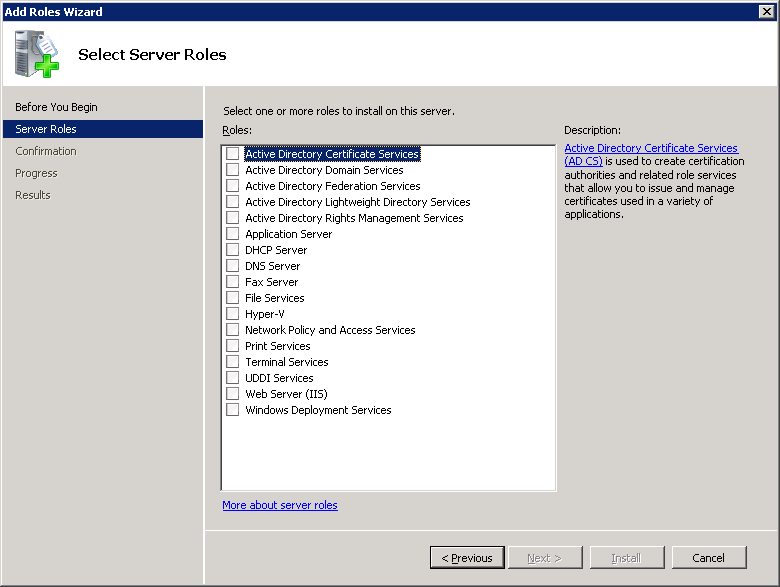 TechNet: “Installing a server role on a server running a Server Core installation of Windows Server 2008 R2: Overview” lists which roles can be used with Server Core (including: AD CS, AD DS (although installation may be a further challenge, as the graphical Active Directory Domain Controller Installation Wizard (Dcpromo.exe) is unavailable, so an “answer file” must be used), AD LDS, DHCP Server, DNS server, “File Services (including File Server Resource Manager)”, Hyper-V, Streaming Media Services, Print and Document Services, and “Web Server (including a subset of ASP.NET)”. (This does not work in Windows Server 2008 Full Installation. If /passive is not specified, the error message says “The specified Windows component could not be found: DCHPServerCore”. Note: Simply installing a role does not mean that it is going to be usefully functional yet. 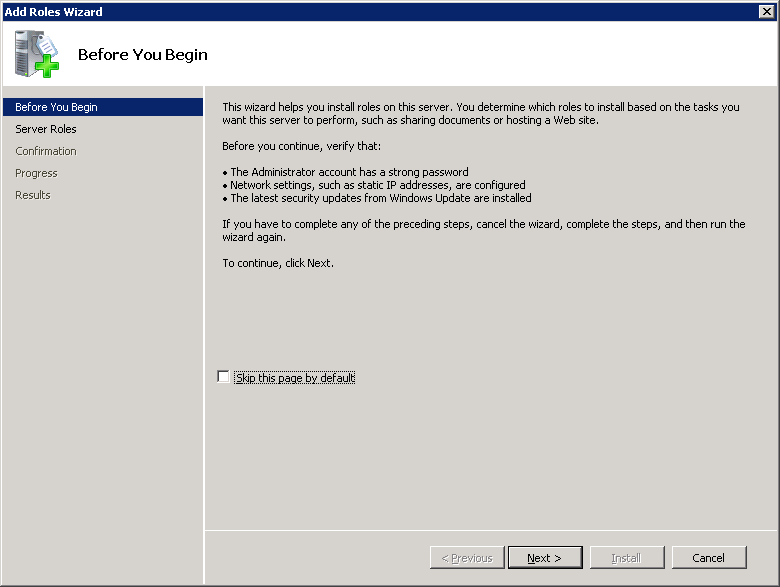 For instance, TechNet: “Installing a server role on a server running a Server Core installation of Winodws Server 2008 R2: Overview states that an “unattend” file needs to be used (to actually get a domain to be installed). Similarly, in order to really be useful, Microsoft's DHCP service may still need a scope to be added. The default log file might be %windir%\Logs\CBS\CBS.log file (for the Component-Based Servicing Log). TechNet: OCSetup's “Troubleshooting” section also mentions the Windows Update log (%windir%\WindowsUpdate.log), Event Viewer, or “Turn Windows features on or off” (under the Control Panel applet related to Programs). From the command line, this can be started with: “ start control appwiz.cpl ”. Built into the operating system is a control panel application for programs, with a name including the word “Programs”. (In Windows 95, this was called “Add/Remove Programs”. In Windows Vista, this is called “Programs and Features”. In some versions of Windows, this might be named “Software and Programs”. Another resource that describes this is: Application wizard control panel applet. Both methods involve running uninstallation programs that were provided by the supplier of the software. Therefore, there is no particular reason that the uninstaller would be any more trustworthy than the software it cames with. Sometimes the uninstaller may be a program that starts by presenting options including uninstalling the software and other options, such as repairing the software installation or even installing new software components. This approach does work for consumer versions of Microsoft Windows. Software may be added through the control panel applet which is about programs. For older Microsoft Windows operating systems, such as Windows 95, this may be limited to components that the operating system knows about, which would basically be a list of software that came on the operating system CD. Some newer versions of Windows may call such software “Features” of Windows, such as Windows Vista which describes such software as “Windows features”. Windows 7 (and maybe some other versions as well?) has an OptionalFeatures command. This command shows the “Windows Features” window similar to choosing Features from within the “Programs and Features” control panel applet. A rather ironic method of installing software may sometimes be available: choosing the option named “Uninstall” which is used to uninstall software. When running an uninstaller (as found in the control panel applet about programs) (or as found on the Start menu), the uninstall software may provide options including uninstalling software, repairing software, or even installing new software components. For example, if a partial installation of Office is installed, including Microsoft Word and some database software, one might be able to go to the control panel applet, find an entry related to Microsoft Office, choose “Uninstall” so that the uninstaller runs, and then use the software that runs to view installed components and change which components are installed. One could use this method to install Microsoft Excel, a popular and major component of Microsoft Office. There are various approaches. In some cases, this may not be significantly different than the more general topic of Installing software bundled with Microsoft Windows. However, this section focuses on some of the interface/unique experiences encounted with the Server operating systems, in ways which may differ from the consumer-oriented variations. Dism /online /get-features /format:table | find /i "Role"
Once the desired role has been identified, see: adding Windows features for info on Dism. This is also an option. See: Windows optional component setup. To use this approach, the first step is to get to Microsoft Windows “Server Manager”. Select “Add Roles” (by pressing the space bar, if it was tabbed to). Another approach (generally longer) is to first go to the “Roles” screen, which can be reached by choosing the “Go to Roles” which is right next to the “Add Roles” option just mentioned. Or, in the left frame, there is the “Roles” option (likely/certainly the very second option in the tree of options). Then, on the “Roles” screen, the directions are similar to the more commonly used path: in “Roles Summary” section, select the “Add Roles” option. Options are available, as seen in the top two otpions of section 3 (“Customize This Server”) in the following Windows Server 2008 screenshots: Initial Configuration Tasks (example screen from running Microsoft Windows at 800x600 resolution), Initial Configuration Tasks (program window when Microsoft Windows is at 1024x768 resolution). Either way of getting to the “Add Roles Wizard” works fine. Choose one or more desired role(s) to add. (That may be done by pressing the down arrow, and pressing the Space Bar to alter check boxes.) Once every desired role is checked, press the graphical “Next >” button. The Add Roles Wizard will/may then ask questions about each role that will be added. At some point, advancing to the next screen will get past any screens that are specific to the role(s) being installed, and the screen will go to a more generalized “Confirm Installation Selections” screen. At this time, before choosing “Install”, there is the option to press Shift-Tab a couple of times to highlight “Print, e-mail, or save this information”. (Then, after confirming that option is now selected/highlighted, press Enter to use that hyperlink.) Selecting this option causes the default web browser to go to file:///C:/Windows/logs/ServerManagerInstallationLog.html. (Perhaps selecting the option will actually create that file if it does not yet exist?) This file may then be handled like any other web page; this file may be backed up, E-Mailed, etc. When done interacting with the Server log at this point, the “Add Roles Wizard” has the “Next >” button may grey out, and the button to its right may show as “Install”. Proceed with that button. The final screen may provide a warning about a required reboot. 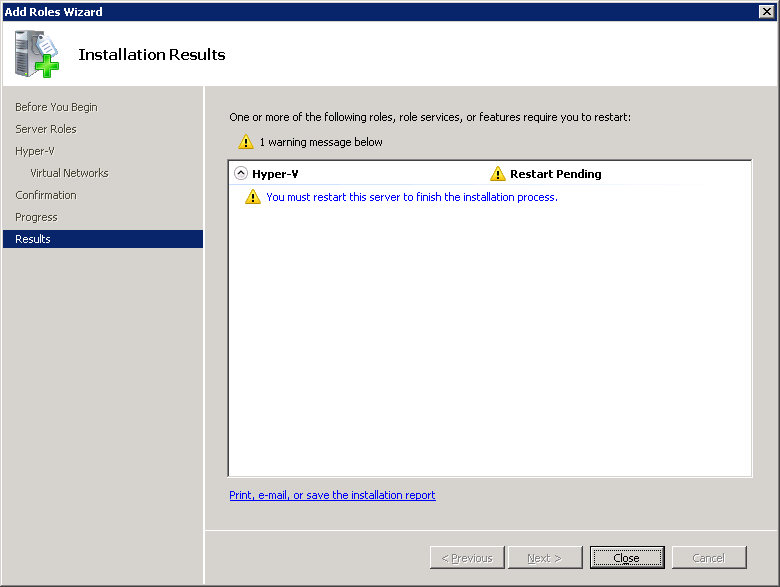 For example: [“Installation Results” screen showing a required reboot (after installing Hyper-V)]. If the logs have already been viewed (if that is desired), then selecting “Close” is safe. It proceeds to [“Add Roles Wizard” screen offering to restart]. When asked about performing a reboot, choosing “No” and then Alt-O (to “Close” the previous Results screen) leads back to [“Server Manager”, now with the higher (second) status bar displaying the message, “Console cannot refresh until computer is restarted” next to a “Restart” hyperlink]. Rebooting the operating system sooner, rather than later, is generally preferred for multiple reasons: the new software may function better after the reboot, and authorized users can once again have the ability to perform tasks such as adding additional Features or Roles. 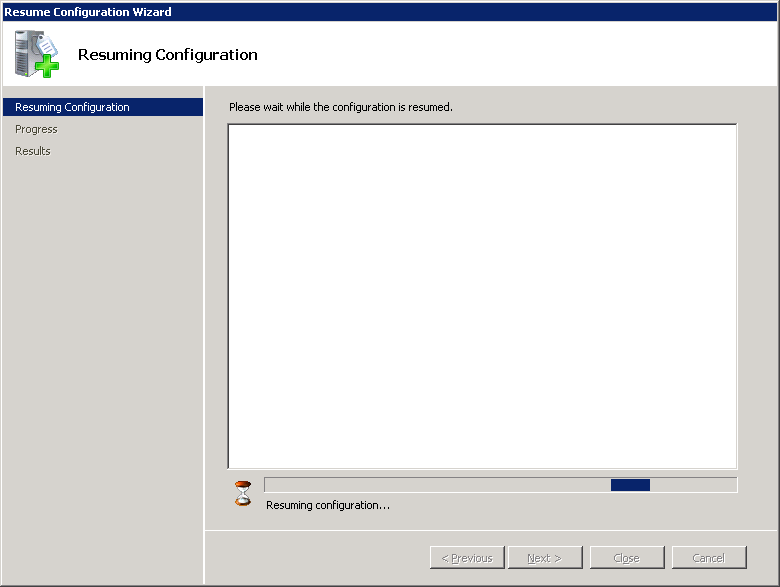 After the reboot, and then after logging in, a [“Resume Configuration Wizard” screen] may appear. Then a “Progress” phase may say “Collecting installation results...”, e.g. 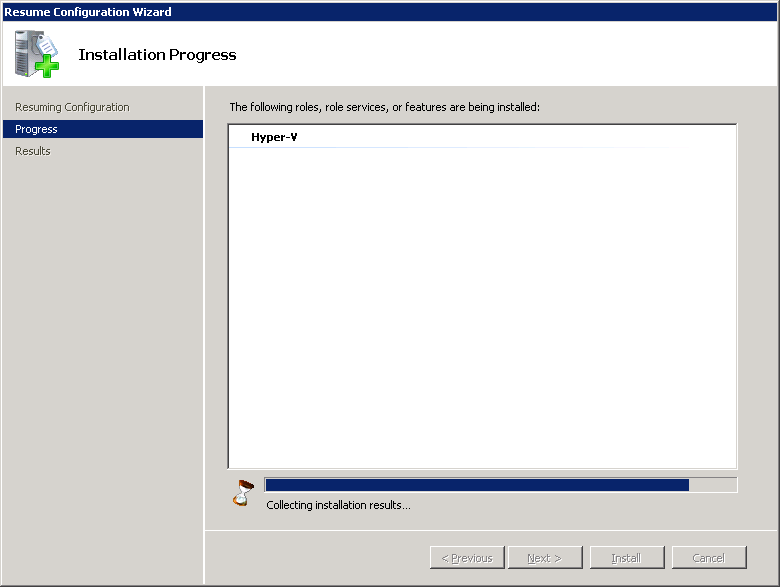 “Collecting installation results...” for Hyper-V. Then a Results screen may show how smoothly the installation went. (e.g. 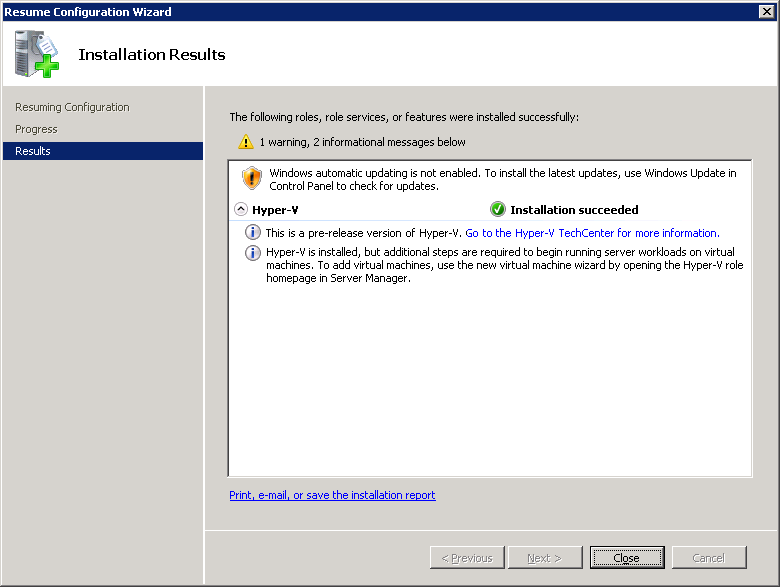 Results installing Hyper-V in Windows Server 2008, which comes with “a pre-release version of Hyper-V.” Rather than immediately using the “Close”, it is recommended to first (press Shift-tab to most quickly) select the “Print, e-mail, or save the installation report” hyperlink. Windows Marketplace is a web site which may be referenced by some of the software built into some of the Microsoft Windows operating systems. For example, Windows Vista refers to this directly via the Programs control panel applet, and that operating system also refers to this web site from the software named “Digital locker assistant” (which may be run from the control panel applet). For cleanup, Microsoft has released multiple programs with a name including the word “Cleanup”, and such tools may help uninstall some software (perhaps limited to Microsoft software) more completely in case the software doesn't appear to be fully uninstalled. Examples include software with names such as “Windows Installer CleanUp Utility”, “Uninstall Cleanup Tool”, and “.NET Framework Uninstall Tool”. As these seem to be regularly updated (probably to add support for newer software), it may be best to just download these on an as-needed basis. Simply search for this if the need comes up, and make sure to not use any software unless it comes from a trusted location: namely *.microsoft.com. Microsoft has released an “Automated Installation Kit” (“AIK”) for some software. For instance, details are available at the “Readme” file for the Windows Automated Installation Kit for Windows 7. There may be some third party solutions. (These haven't been fully tested at the time of this writing, so only use at your own risk!) One of the compelling reasons why package management solutions are frequently used in other operating systems, such as Debian-based releases, is because those package management systems are the most well known easy method to obtain software for such platforms. Although that reason may not be as compelling for the Microsoft Windows platform, since other operating systems may have other solutions, there may be other benefits to using package management software which check known software repositories, including easy installation (including dependency handling) and uninstallation, easy ways to check for substantial new versions of software, and the ability to check reputation (perhaps mainly by simply checking whether software is even in a specific repository). Following is a brief list of programs. At the time of this writing, the author of this text has not thoroughly reviewed and tested each of these. So, consider this list to be a brief list of resources, not necessarily recommendations. This was formerly known as “Windows Package Manager” (which explains the URL of the home page). The wpkg software GPL'ed package management software made by the usys team, and is a very separate option from WPKG which is GPL'ed software designed to install software to networked Microsoft Windows computers. GetIt has been described as useful for installing software packages, while Dispatcher creates installers. GetIt works with other software package management software. A commercial organization. The Ninite website allows a person to choose a selection of software and then quickly create a custom installer that will install everything that was chosen. The commercial organization keeps track of the latest versions of several popular programs. Also note that, realistically, this list is not extremely likely to be kept up to date in the foreseeable future. So, check some of the other resources if there is a need for something that is staying on top of developments regarding what is available. Wikipedia's “List of software package management systems” article: “Cross-platform” section may list some cross-platform solutions. Wikipedia's “List of software package management systems” article: “Microsoft Windows” section. Much of the software on that list has been mentioned on this page. Wikipedia's “List of software package management systems” article: “Application-level package managers may list some more solutions. Wikipedia's page on “Package management system” lists some other options for getting software. The software in that list may be designed to try to use other sources/programs to accomplish the goal of installing the desired software. Some old information indicated that Wikipedia's page on “Package management system”: section for “Microsoft Windows” page made a reference to GetIt, but that reference seems to have been removed from the page, as well as any section specific to Microsoft Windows. a review called “3 Software Updaters to Keep Your Programs Up To Date” offers some review, mentioning a program that is called QWinApt: Quick Windows Apt tools. Ninite allows the creation of an installer that will install one or more popular programs, such as web browsers and add-ons, and anti-virus software. Other highlights include a user interface enhancement (Classic Start), software that helps to provide encryption for common tasks (PuTTY and WinSCP), and, for gamers, Steam. One of Ninite's most useful features is that Ninite stays up to date, so that the latest versions of the software get installed. A single installer can be custom-created to determine which software to be installed. The installer can then be executed to automatically install all the programs that the installer was designed to install, without requiring any user interaction (once the installation program starts). The list of supported software is made available at Ninite's home page. This can be useful even for those who don't choose to view Ninite. It is an easy way to check the version numbers of the supported programs. Also, from time to time, additional programs are added. The supported programs tend to be very popular, free programs. So, checking that list of programs, from time to time, might be a way to learn about a new popular program. The Humble Bundle team has released an app for Android. For Microsoft Windows, Humble Bundle generally partners with Steam. For games that are not distributed via Steam, the games may be downloadable from Humble Bundle's website. Grand ol' Games has been known to offer some better pricing than their main rival, Steam. For further details, see: Steam for Microsoft Windows. Steam has provided software code that some game creators have included, providing integrated support for features like Achievements that can be viewed on the Steam website. Steam has also started working on “Steam OS”. Steam is well known for working with publishers to offer special, short-term sales (many of which may be repeated at a later date). Sometimes these savings are offered as part of a bundle that provides multiple products (quite commonly involving related software products, like expansion packs or other “downloadable content” (“DLC”) add-ons for a game). Savings can range from relatively insignificant amounts to substantial discounts, like 80% off. In addition to being able to find various software by going to the various vendors, there are popular archives which may have lots of different software. Some recommended repositories include: mozdev PluginDoc: Windows (Most Popular), PortableApps.com, TOOGAM's software archive, SysInternals, SourceForge (which has a lot of great software, although this site also has a lot of software for platforms other than Microsoft Windows). The download page for Wine from WineHQ.org may provide some details about other formats being used: .txz by Slackware 13.1, .pbi for PC-BSD, .pkg for Solaris. Another package management system used is portage, and it is used by Gentoo (and Sabayon). A package manager named “pacman” is used by Arch Linux. Wikipedia's page on Linux Mint: section on “Software developed by Linux Mint refers to “Software Manager”, with a note that “The option to use the old MintInstall program is available”. The following may not be primarily about a centralized package installation tool, but still be related on some way to distributing software packages. Popular software repositories may often be the default repositories used by some popular package management software solutions. For this reason, it is recommended to check for information about repositories in the sections about package management software; specifically in the subsections about customizing/checking/changing which software repositories are used. Here are some additional ones. Debian Backports has been moved to the debian.org website; it had been at http://www.backports.org. Older versions may be at Archive.Debian.org's section of Debian Backports. Perhaps see also: Wikipedia's page on Super_OS: “Software repository” section. Apple II Asimov FTP site has a lot of software for the Apple II platform. Legal software can be obtained from Zophar Domain's Legal ROMs section ( http://www.zophar.net/pdroms.html ). Some of the ROM software is distributed with source code, such as Tic Tac Toe for the Super NES and Bingo for the NES. (Both of these examples have been made available from Zophar's area of legal ROMs). ROM software may also be legally downloaded from MAME's ROMs for Free Download, although that site notes that the ROMs are not necessarily redistributable. Although there has been some stigma in using ROMs on emulators because of less authorized use that occurs in some cases, there is nothing illegal nor shameful in legally using such ROMs when proper authorization has been freely granted. Many of the free, legal ROMs may not have been commercial in the past. Those ROMs may often be less famous examples, often being developed in homebrew environments. Quality of such games may, in at least some cases, be notably less than comparable polished games that were created with the financing of commercial budgets. For some commercially available games, purchasing a legal license for non-commercial (home-based) use is an offering that was available from StarROMs before Star ROMs closed down. The ROM code of a the “Game Genie” for the NES was released by CodeMasters, who designed the device and who used Mattel for distributing and marketing the device. Updates in software are often able to be implemented in one of two basic ways: applying an update to the older software, or completely removing the older software and then installing the newer software. Using an update may be faster, and may be smaller to download than an entire newer version. In some cases, the latest version of software (or critical data, such as tables of tax information used by financial software) may commonly be distributed as updates, so applying updates is required in order to reach the latest version of the software and/or related data. Guidelines on performing updates will vary. Some strict guidelines for an organization, for example, may require that the updates be pre-tested by having them be installed on less critical machines before they get applied to more critical systems. Those less critical machines, which may be designed exclusively for the purpose of being used to test updates, are generally expected to differ very little from the machines that are used in an actual production environment. For instance, logs showing when the machine was last logged in, and by whom, will vary. However, other than the small subset of data related to how the system was used, and by whom, and when, all other details of the machine may be identical to what is being used by an end user. Such rigid guidelines may commonly not be applied to smaller organizations, such as a household with only a single resident who uses only a single computer. However, even in such cases, it is good to make sure that crucial data is fully backed up. (Actually, ideally important data should be getting backed up even when no updates are planned.) Even if the software update process results in a report showing that the update was successful, the resulting software after the update may not work as well as before the update. In very severe cases, an operating system may not fully start. Some software will have an option to automatically check for updates. The clearest example of this may be anti-malware software, where updates are generally considered essential to continue to be decently useful. A well-done implementation is Firefox, which informs users (and may automatically download) when the program is started. A comparatively poor method used by some software is to run a special program whenever the operating system starts up. This method not only increases the time of the system's startup process before the system is decently useful, but ends up costing resources even if a user has stopped using the software. Some software will come with a method to update the software. In some cases, updates may be checked for by going to the program's “Help” menu. (e.g. Adobe Reader?) In a small number of cases, Windows Control Panel may have a control panel applet for the software (e.g. Java (what? JRE? ), QuickTime?) and that control panel application may have an option for updating. Software that supports package systems, such as pkg_*, apt, and yum, may often have a way to update software. This can be advantageous. Instead of the developer's sites needing to support bandwidth, software repositories dedicated to sharing software can take on the role of providing the bandwidth. Administrators of a computer system or a network of computer systems can roll out updates of multiple pieces of software at a time when it is convenient for the administrator to spend time implementing the updates and when there will likely be time for handling the additional support that updates may cause. The Administrator may also be able to use a rather uniform process to roll back an update on multiple computer systems if the update ends up being problematic. Automatic updates may be applied in some cases. Centralized updates may be applied in some cases, and individuals wishing to upgrade earlier might be barred (by security permissions) to perform that task (or they might be allowed to do so at their own risk). Updates may be made available from a vendor. In some sense, updating an operating system is simply a case of updating software. Sometimes some special software may be commonly used for updating the operating system. A lot of these details are specific to an operating system, and so there is a separate area discussing operating system updates to cover many of the details. For some, like multiple versions of Microsoft Windows, this may cover a concept such as automatic updating. In other cases, compiling from souuce code may be a covered topic.